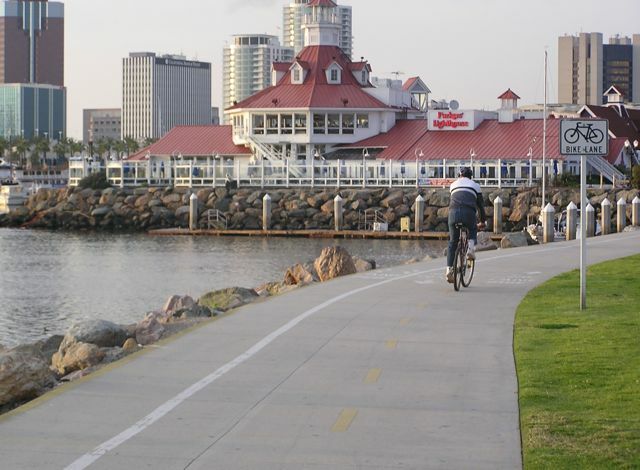 Long Beach is a SoCal star when it comes to bicycle advocacy and infrastructure, Silver-rated by the League of American Bicyclists. As far as easy scenic cycling goes, coastal Class I trails provide a ton of excitement, interesting vistas, and even some good exercise where bikes and peds are given their separate lanes. 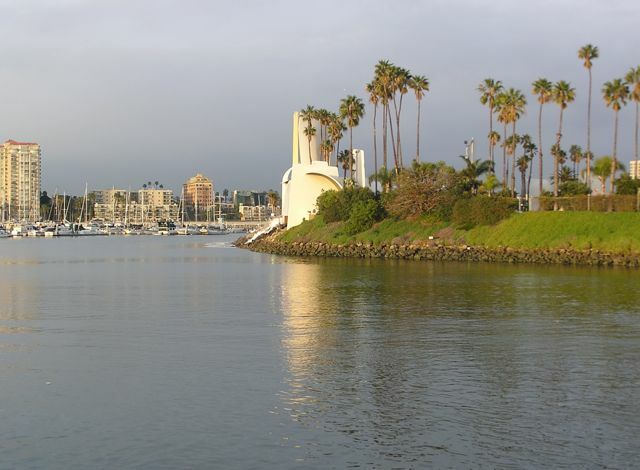 For more cycling fun connect via bike-friendly surface streets to the Belmont Shore district, the very Italian Naples Island with its canals, and the laid back beach town of Seal Beach, with the option of riding along Pacific Coast Highway to reach the great Huntington Beach trail along the sand. 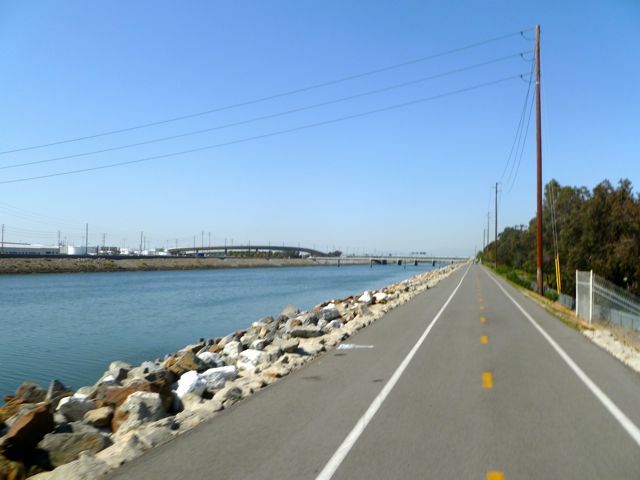 Also available for a good workout are somewhat less scenic river trails up the Los Angeles River (the LARIO trail) from Long Beach and the preferred San Gabriel River Trail from Seal Beach. 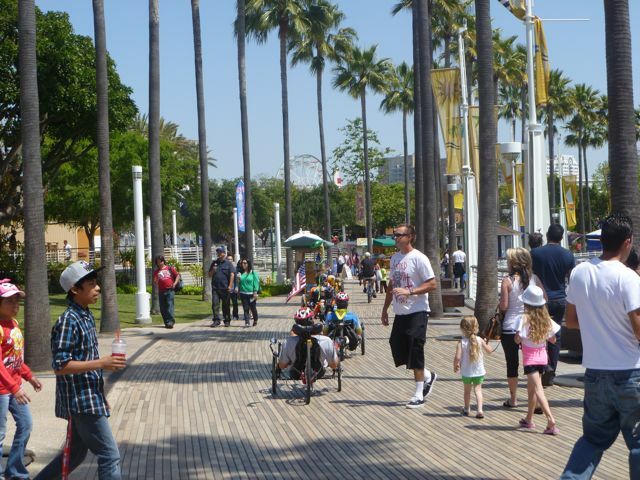 The annual Tour of Long Beach event with several levels of rides benefits pediatric cancer and starts along the downtown Long Beach waterfront. Next event: May, 2019. enCYCLEpedia Southern California had its book launch at the finish line festival in 2014. 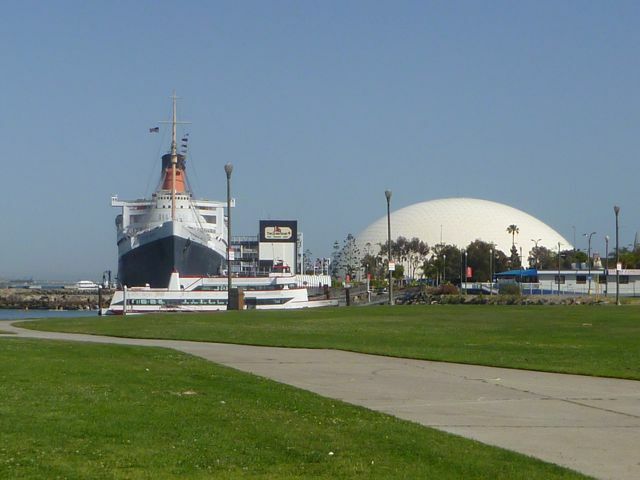 Trail near Shoreline Village in Long Beach affords fabulous vistas including the Queen Mary. 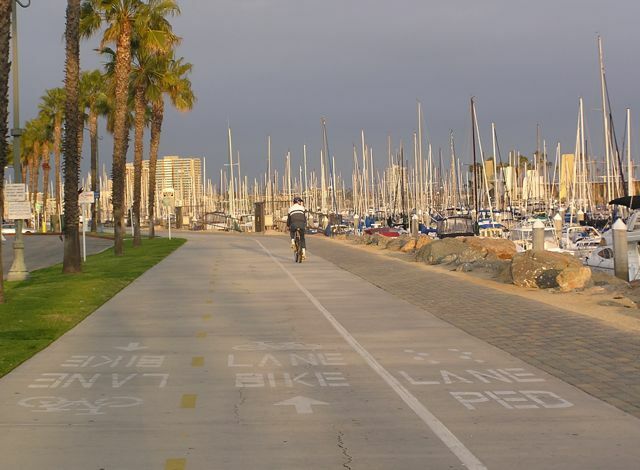 Bike trail passes the Long Beach Marina. 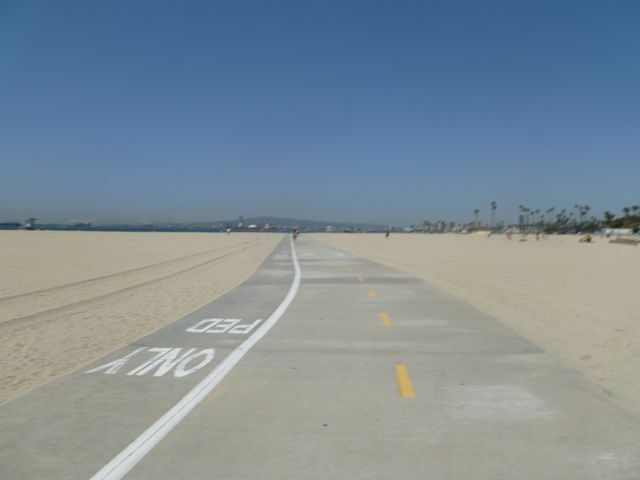 The 3.2-mile beach trail had a separated pedestrian lane for smoother travel, however…. A new ped path adjacent to the Belmont Shore bike path has vastly improved the experience for both cyclists and peds. A digital sign counts number of trail users. Cycling toward Shoreline Village and its great selection of waterfront restaurants. One of the THUM oil islands, Island Grissom, as seen from a waterfront bike trail. A trail though Harry Bridges Park leads to the Queen Mary. A number of additional trails are planned for the Queen Mary side of the channel in the future, which is accessible from the Shoreline area via a separated bike path along the Queensway Bridge. Trails wind around and up to the lighthouse at Shoreline Aquatic Park. 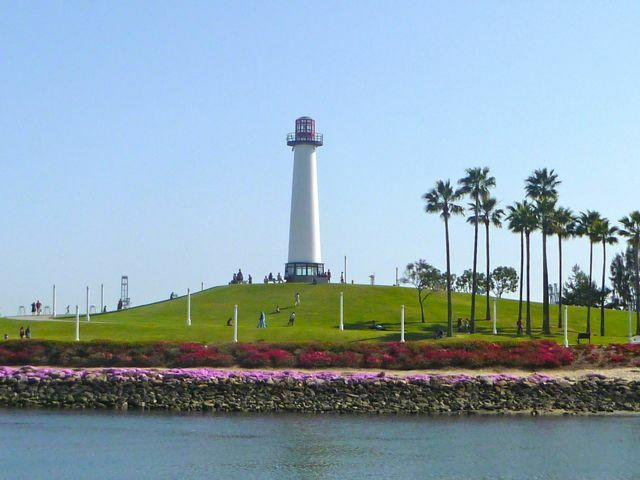 Enjoy great vistas of downtown and the Queen Mary from the top of the knoll. Busy area along the trail near the Aquarium of the Pacific. 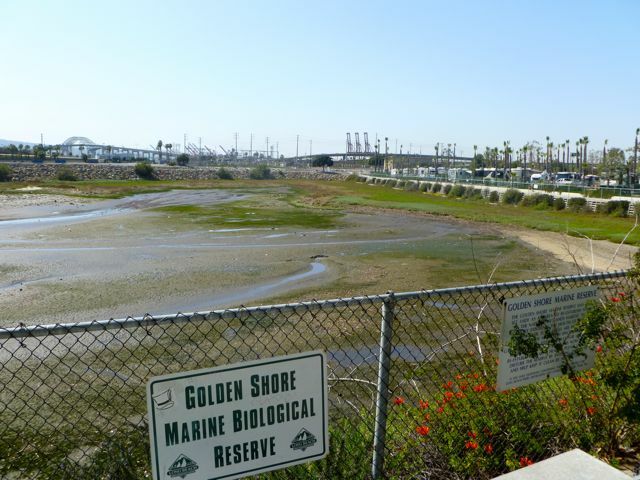 The trail passes Golden Shore Reserve and Golden Shore RV Park. Naples Island is a delight to explore by bike. Cycle for miles up the Los Angeles River and the LARIO (Los Angeles/Rio Hondo Rivers) path, but scenic value tends to decrease as you leave the coast, and it also passes some areas known for higher crime. 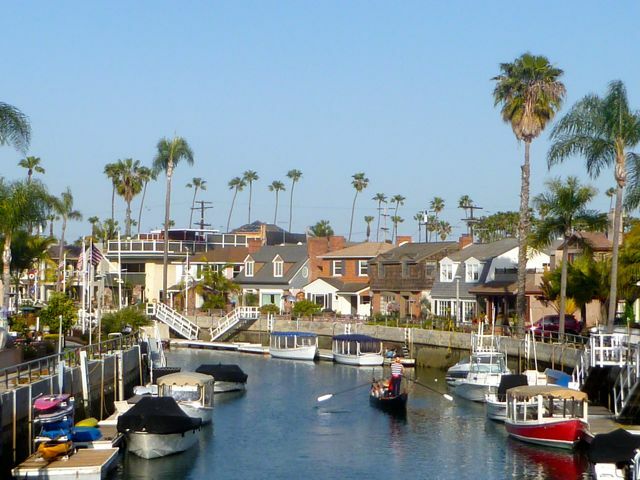 Previous PostOceanside – North San Diego County’s Cycling GemNext PostMichigan’s Mackinac Island – Scenic, Romantic and Bike-a-licious!